On a cold October morning in1849, Edgar Allan Poe, poet, writer and literary critic, was found in the streets of Baltimore, unconscious and wearing ill-fitting clothes. The stricken author was taken to nearby Washington College Hospital where he languished hallucinating for nearly four days before finally giving up the ghost. There are twenty-three theories about what caused the author’s untimely death. Being parodied by a playwright and a preposterous production is not one of them. 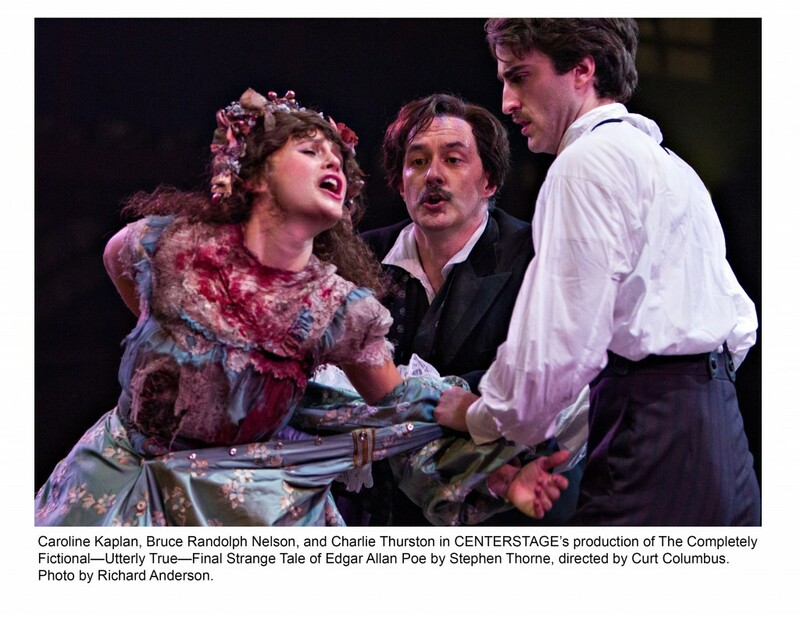 The Completely Fictional – Utterly True – Final Strange Tale of Edgar Allan Poe, which opened Wednesday night at Centerstage, doesn’t really answer the question of what killed Poe. Instead, the play grapples with the question of what may have been going through the mind of a dying man. Having Poe’s life flash, as it were, before his dimming eyes is indeed a worthy idea; however, what emerges is not a recognizable chain of events but rather, something more akin to a late night Pabst-and-pizza-induced dream within a dream.The show features an ensemble cast of seven actors who portray both background parts and a number of characters from the author’s life – from his long dead mother and stern stepfather to his sickly, child-bride. The story opens with an obsessive, disoriented Poe surrounded by hospital staff; the writer completely unaware that he is a dying man. The scene abruptly changes from a dour death watch into a burlesque affair; the first of many such jumps in Poe’s fevered mind. There were genuine belly-laughs at this sudden shift of gears and a handful more in several succeeding scenes. But there was nervous laughter, too, as the audience never seemed sure of the script or the director’s intent. Was this a comedy? Was it a drama? A fiction? A farce? It’s impossible to say. Baltimore favorite Bruce Nelson, as the tortured Poe, bursts onto the stage with an abundance of energy but then has nowhere left to go. Any nuance in his complex character is lost in the cartoonish nature of the narrative. To his credit, Nelson maintained his high energy level throughout the show, as if somewhere in his actor’s heart he felt that he was carrying the weight of this production squarely on his shoulders. Nelson was not alone. Most of the cast seemed to struggle mightily to make some sense of this play. As an ensemble, in the hospital and the parlor scenes, the cast worked reasonably well. It was in the feature roles where one might like to bury a few actors beneath the floorboards. Libya Pugh, as Valdamar, wasted little time making this viewer’s eyes glaze over. Her turn as Poe’s enigmatic mesmerist was hindered, first by her deadpan delivery, and then by a vague French accent which relied more on Cloris Leachman than on Leslie Caron. The scene with Valdamar and her ghastly “patient”went on for far too long, ending with what is best described as simply a gooey “boo!”. Pugh’s Valdamar was followed in Poe’s nightmarish madness by Jimmy Kieffer as Charles Dickens. The appearance on stage of the beloved Brit came as a breath of fresh, familiar air. There was warmth and chemistry between Nelson and Keiffer. It is fair to say the two Dickens/Poe scenes are the high points of the production. Conversely, when Keiffer appeared later in the show as Poe’s stepfather, John Allan, he ineptly opted for a jarring, bombastic approach. It didn’t help that he was dressed like a figure from a steampunk convention. Naomi Jacobson, as Poe’s mother Eliza, had little to do besides faint in her first scene, then played her second scene more as a scolding bubby than as Poe’s sweet, songstress mother. In real life, Eliza died when she was about twenty-four and Edgar was not yet three. It is hard to believe even a delusional man would imagine his mother as a dictatorial, decaying Carol Kane. Caroline Kaplan, who spent most of the show as a background player, shrieking and spinning, simpering and sighing, finally took the stage in act two as Poe’s ill-fated child-bride, Virginia Clemm. Kaplan inexplicably turned the delicate Clemm into a psychoneurotic Ophelia. The real Virginia died of consumption at the tender age of twenty-four. Kaplan’s stage-blood-spewing take on the character makes one wish the fragile maiden had died much sooner. Charlie Thurston, who also appeared in the original production as the young Edgar Poe, had several nice moments batting familiar lines back and forth with his dying doppleganger. Thurston gave a spirited performance, though his bloody final exit came across as just another occurrence of salacious gore. Kenneth Lee, as a sympathetic doctor, and Erick Pinnick as Dr. Moran, are both solid in small simple parts. There are a number of anachronisms in the play, like a portable Victrola and an antique Underwood typewriter complete with a death certificate and a handy bottle of Wite-Out. For a delusional, time-traveling Poe, these flights of fantasy may be allowed. The typewriter is even explained, but by then it really doesn’t matter. The audience had long accepted the joke and had certainly ascertained that this show needed more then a few clever props to make the playwright’s premise work. Eugene Lee’s minimalistic set design helps to keep the action moving along, while the lighting of Josh Epstein and the sound design of Zachary Williamson strive to keep pace. David Burdick’s costumes mostly work, save for the unfortunate decision to put Poe’s stepfather, John Allan, into a pair of elevated, Herman Munster shoes. Fault the director here. There are other ways to portray Allan as a towering figure in young Poe’s life, the easiest of which would have been better acting. 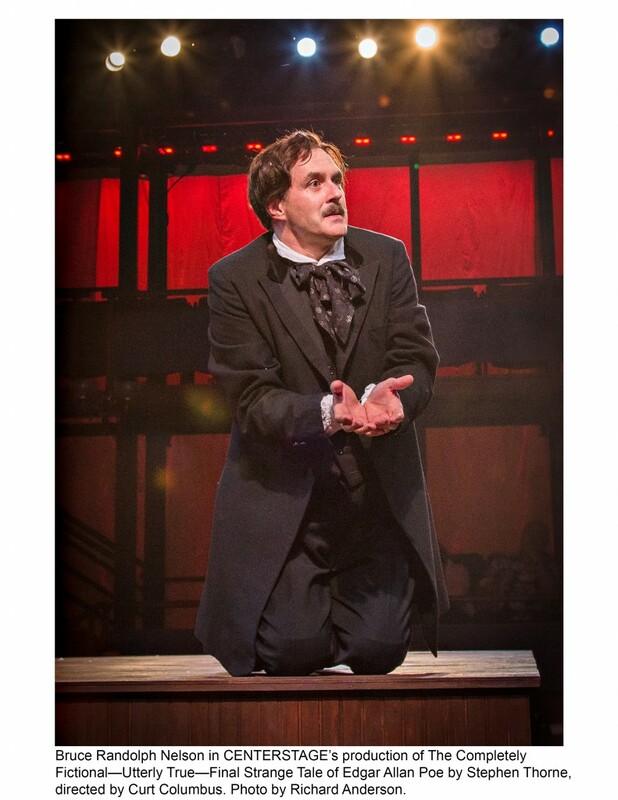 The Completely Fictional – Utterly True – Final Strange Tale of Edgar Allan Poe is not great theater but rather a somewhat macabre, mildly amusing, Halloween season production. It is a work in progress and hopefully the director and the cast will tweak what they can to tighten up the show. After that, it is up to the playwright or some future dramaturg to sort things out. The play runs from to Nov. 25. Tickets start at $10 and can be ordered online at Centerstage’s website or by calling the box office at 410-332-0033.